Perfect Christian or a psychopath possessed by the devil? Malcolm Day reviews the life of the recently canonised bleeding saint, Padre Pio (1887-1968). When the Italian monk Padre Pio was canonised on 16 June 2002, the ceremony was greeted with as much fanfare as if Italy had won the World Cup. The Catholic adoration of this new saint puts him on a par with the world’s holiest and has won him more devotees than Francis of Assisi or Bernadette of Lourdes. Some eight million visitors each year throng the little village of San Giovanni Rotondo in southern Italy where the friar lived; only the shrine of Our Lady of Guadalupe in Mexico attracts more pilgrims. Without a doubt the most popular saint-to-be made in modern times, the miracle-working Padre Pio was also the most controversial. In perhaps the most extraordinary volte-face ever performed by the Vatican, its official line about Pio changed from regarding him as a psychopathic fraudster suspected of fornicating in the confessional to agreement that this simple friar from Apulia was a paragon of virtue so blessed with the power of God that just a touch of his cloak would suffice to cure disease. Christened Francesco Forgione, he was born in the village of Pietrelcina on 25 May 1887. It is said his special nature was recognised early on in childhood, and he entered the Capuchin Order at the age of 15. That same year, on 20 September 1902, he is said to have heard a voice telling him that he would be scourged and crucified like St Francis of Assisi, the first known Christian to exhibit marks resembling the wounds of Christ’s crucifixion (see below). Pio was first imprinted with the wounds during ecstatic prayer in 1915 but, although he felt the pain, the wounds themselves could not be seen until 1918, on the anniversary of the original voice. Again, while in an ecstatic trance, kneeling in prayer before his crucifix, the visible wounds appeared on his hands, feet and in his side. Padre Pio is said to have suffered the stigmata for the next 50 years, until the time of his death, aged 81, when the marks disappeared, leaving his skin without blemish. He said he found them embarrassing and humiliating, and conducted Mass wearing mittens to hide the blood which flowed most profusely during the Eucharistic ritual. But a suspicious Vatican, under the leadership of Pope John XXIII, launched a series of investigations in 1960, including the bugging of his confession box, in an attempt to expose Pio as a fraud. Although there was no denying that the stigmata penetrated his hands, its report claimed that he used nitric acid to induce the wounds, and had assignations with women in his cell. The founder of Rome’s Catholic University Hospital said the monk was mad, a self-mutilating psychopath possessed of the devil who exploited people’s credulity. The so-called “odour of sanctity” accompanying his wounds was no more than eau de cologne applied for an indulgent sting of self-mortification. The Vatican banned him from taking Mass. But not everyone blackened his character. Persistent rumours circulated of apparent cures happening in his name. When, in 1947, the present pope, a mere priest at the time, journeyed from Poland to have his confession heard by Padre Pio, he came away with such an impression of holiness that he later asked the monk to pray for a female friend who had throat cancer. Eleven days later Wanda Polawska was pronounced “inexplicably” cured. She lived to witness Pio’s canonisation in Rome. It is perhaps not surprising that Pio’s rehabilitation stepped on apace once the present pope took office at the Vatican in 1978. The change in the Vatican’s appraisal of their mysterious monk, if anything, has been a spur to even more investigations. Scores of testimonies from doctors and surgeons, both academic and those treating Padre Pio, have come forth. Sceptics claim that the stigmata are psychosomatic in origin – the result of mind over matter – and that, depending on your preference, auto-suggestion, self-hypnosis or a form of hysteria can account for the condition. In the case of auto-suggestion, it is said that the working of the mind coupled with strong emotions could induce the wounds in a person who is in an abnormal state of consciousness, such as ecstasy or hypnosis. Dr Martin J Markey, a clinical psychologist, says that self-hypnosis can result in a wide range of phenomena, but they will always be “organically and neurologically possible”. Self-hypnosis can briefly cause anæsthesia, or loss of sensation, and therefore a lack of pain perception in the limbs, but there is no comparable explanation for stigmata apart from some kind of self-mutilation. Several medical doctors have made examinations of Padre Pio to ascertain the nature of the wounds and assess the possibility of his being an hysteric. No evidence was found to indicate that the wounds were self-inflicted; even more remarkable, they never appeared inflamed or infected, as would be expected of ‘normal’ persistent wounds. Examiners also noted that the wounds were never observed to be in the process of healing. In contrast, when Pio underwent a routine hernia operation, the incision healed up normally, but the stigmata remained. The remarkable stability in their condition has defied medical explanation. Professor Francesco Di Raimondo – a surgeon who has helped the Vatican to certify miracles attributed to Padre Pio – said that he had examined the monk’s stigmata and found them to be “medically inexplicable”. But Pio cannot be said to have a body that functioned normally; he suffered greatly from illness through much of his life. There were times when his temperature could rise to almost impossible levels – as high as 1180F (480C) according to one claim – shattering normal clinical thermometers. He always recovered from these bouts of high fever which never induced hysteria. One of Padre Pio’s closest assistants, Bill Martin, saw him at the worst period of his life when he was suffering horribly. He maintains that if Padre Pio had been subject to hysteria, this would have manifested at such a time; instead, the friar always remained his usual good-humoured self. The Catholic Congregation for the Doctrine of the Faith – formerly known as the Holy Office and, before that, the Inquisition – kept Padre Pio under surveillance for 50 years, but never detected any sign of hysteria, despite the fact that such evidence would have been useful to his enemies! Dr De Vincenzi once witnessed Pio in a state of ecstasy and at first diagnosed a cataleptic state – a trance-like seizure sometimes accompanied by loss of sensation and consciousness, often associated with hysteria – but changed his mind, saying that Pio’s ecstasy was beyond scientific explanation. One of the more sensational aspects of this enigmatic saint involved his experiences immediately before entering a state of ecstasy. His spiritual director in the 1930s, Padre Agostino, spoke of Pio’s “terrible diabolical vision of women” dancing naked about the cell where he lay sick. Agostino has asserted, with bold confidence, that there was no doubt that Pio was still a virgin. Others find these visions to be symptomatic of an hysterical personality, quoting Sigmund Freud’s analysis of hysterics as having a tendency to exhibit sexual abnormalities. Apart from spooky wounds and weird physiological aberrations, Pio was renowned for having another mysterious facility also attributed to saints and mystics of the past; the ability to be seen in more than one place simultaneously. Known as bilocation2, it has been recorded in the hagiographies of Saints Antony of Padua and Ambrose of Milan. In 1774, St Alphonsus Maria de’Ligouri is said to have appeared at the bedside of the dying Pope Clement XIV, while he was observed to be in his cell four days’ journey away. Witnesses to Padre Pio’s bilocations include several cardinals. In 1925 he was seen entering a sealed room in the Vatican and kneeling at the side of Pope Pius XI, when it was known that the monk was present in San Giovanni Rotondo at the time. Among the most remarkable of the stories of his bilocation was his appearance in the air over his home town (San Giovanni Rotondo) during the Second World War. Allied pilots based at Bari, in southern Italy, were flying sorties into Nazi-held territory during a search for a cache of weapons hidden somewhere in the area of San Giovanni. In their approach to the town, several pilots reported seeing an apparition in the sky in the form of a monk with upheld hands. They also described some sort of ‘force-field’ that prevented them flying over the target rendering them unable to drop their bombs. According to Bernardo Rosini, general of the Aeronautica Italiana, and part of the United Air Command at the time, one after another mission returned to base reporting the same apparition. Initial mockery gave way to apprehension and, eventually, an incredulous US Commanding General decided to take up a squadron under his personal command with the same result. Bombs from all the sorties obliterated the surrounding area, but not one fell on San Giovanni Rotondo. The American general, not one to be made a fool of lightly, determined after the war to go to this little town and seek out the monk blessed with special powers who was known to live there. On entering the Capuchin monastery, he saw a group of friars and immediately recognised among them Padre Pio as the one who had appeared in the sky. Immediately Pio went to greet him, put a hand on his shoulder, and is reported to have said: “So it is you, the one who wanted to do away with us all.” According to Renzo Allegri3 the general knelt before him in awe and subsequently converted to Catholicism. 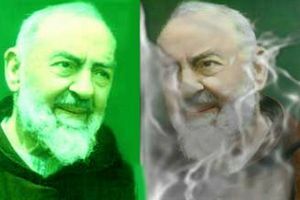 On being asked about his bilocations, Padre Pio is said to have replied that it was an “extension of his personality”. Another example was reported by the Piacenza daily newspaper in 1968, shortly after his death in September of that year. Some 10,000 people had gathered in the rain at San Damiano, a town in which lived a woman who had made an inexplicable recovery from advanced intestinal tumours after being visited by a nun sent to her by Padre Pio. They observed a strange solar phenomenon, similar to those reported at Fatima in Portugal in 1917, after which they saw an image of a monk suspended in the sky. They believed it to be Padre Pio. Hundreds of photographs were taken and examined in Paris by the National Office for Study and Research in Air and Space. No scientific explanation was offered. Sceptics claim the photos are either fake or represent unknown atmospheric conditions. Of course, those who have benefited from their encounters with Padre Pio tend to believe in his miraculous gifts. Among these are the parents of Matteo Collela, a seven-year-old boy admitted, one night in June 2000, into the intensive care unit of the hospital founded in San Giovanni Rotondo by Padre Pio. Matteo was in an advanced stage of meningitis; by morning, nine of his vital organs had stopped functioning and he was given no hope by doctors. Matteo’s mother and some friars who knew Padre Pio conducted a prayer vigil that night and a sudden, unaccountable recovery followed. On waking from the coma, Matteo said that he had seen an elderly man with a white beard and a brown habit who said to him: “Don’t worry, you will soon be cured.” This figure was identified as Padre Pio. This event was adjudged by the Vatican’s Congregation for the Causes of Saints to be a miracle cure – the second officially confirmed in the monk’s name since his death – fulfilling the prerequisite for his canonisation. Whatever opinions may be held about St Pio’s physiology and personality, there is little doubt that remarkable cures have come about in association with his name. For more on Padre Pio, see FT124:18 and 160:14. The stigmata are, classically, the wounds suffered by Christ during his crucifixion. The earliest record of someone imprinted with these wounds is from September 1224 (St Francis of Assisi, left). In his broad survey of the phenomenon, Ted Harrison writes that since St Francis, there have been over 400 known stigmatics, of whom just over half were members of religious orders and only about 50 were male. There have been 25 living stigmatics in the last quarter century. Remarkably, some wounds have taken specific shapes, such as a cross, and even, as in St Pio’s case, been invisible. The Church, though, cannot lay claim to exclusive ownership of the phenomenon either. A number of cases of stigmatisation have been recorded among non-Catholics – for instance, a young black girl, Cloretta Robertson, of California, in 1972 – and even among Muslims, who have borne wounds that correspond to those received by Mohammed in battle. Lance wound – usually in the right side of the chest, corresponding to where a centurion pierced Christ’s side with a spear to end his suffering. The legendary artefact known as the ‘Spear of Destiny’ is said to be this very spear and the centurion was condemned to immortality. Heart wounds – Some stigmatics feel a chest pain they attribute to their heart being pierced. Rarely is anything further confirmed; in the case of Blessed Charles of Sezze (d.1670), a post-mortem revealed the wound piercing his heart was in the shape of a crucifix. Hands – it is known that the Romans usually put nails through the wrist to better bear the weight of the body, yet records of a stigmatic with wounds in this position (Gladys Motta; see next issue) provide one of the exceptions. Mostly they are on the palms and opposing region on the back of the hand, taking a variety of shapes (eg. slits, patches, squares, and holes, some completely though the hand). Ring – very rarely, some devout soul will report receiving a ‘marriage’ ring direct from Christ. The visible sign is a thickened band of skin around the finger; others remain invisible leaving an indentation around the finger. Feet – like the nail wounds on the hands, these take a variety of shapes, sizes and depths. None has been reported on the heel, the most likely location for the lower nail. Malcolm Day is a freelance writer and editor specialising in religious phenomena and spirituality. He wrote The Book of Miracles and A Treasury of Saints, both published this year and is currently writing a book on Hinduism. He is married with two very young children and lives in Somerset. 1) Letters Vol 1, No 511. The collected letters of St Pio make over 20 volumes. I have not seen these directly but they are consistently cited by the many authorities on his life. 2) The appearance of an individual in two places simultaneously is an uncommon but ancient phenomenon. Many believe it can be practised at will by mystics, saints, ecstatics and holy figures, but the precise nature of the event is not known. The majority belief is that a double is projected that is perceived as solid and indistinguishable from the original; but because, in some cases, the ‘original’ is in meditation or trance, an alternative theory is that it is the double which is left behind while the original is ‘teleported’ to the new location. Little serious attention has been paid to the phenomenon, but in research for the Society for Psychical Research, WH Myers describes secular accounts of phantoms of living relatives as cases suggestive of bilocation (see Phantasms of the Living, London, 1886). One interesting feature common to many cases is the proximity to death of the individuals seen. 3) Renzo Allegri. I Miracoli di Padre Pio (Milan, 1993). 4) Ian Wilson. Stigmata… (HarperCollins, 1989). Stigmata: An Investigation into the Mysterious Appearance of Christ's Wounds in Hundreds of People from Medieval Italy to Modern America - Ian Wilson (1989).